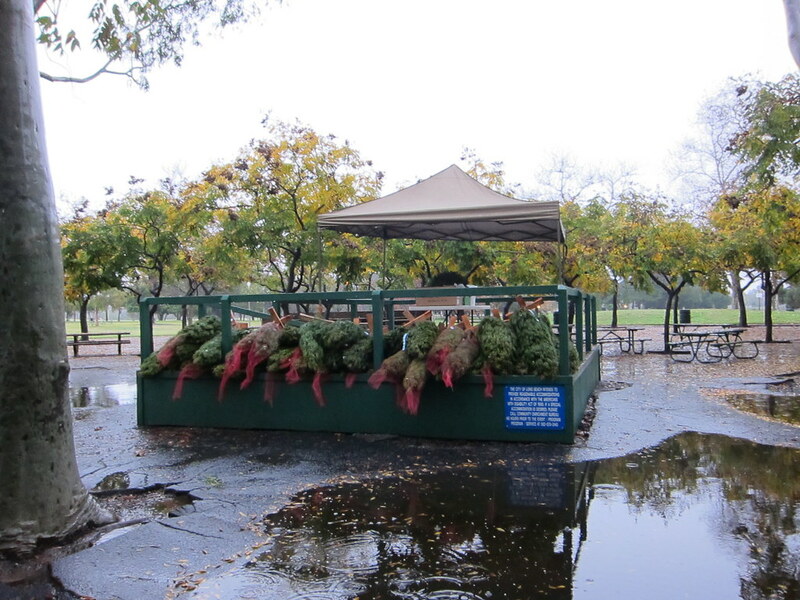 On a rainy shortest day of the year morning, at the Winter Solstice Christmas Tree 5 Mile Run, the Green Girl's boyfriend joined her and did his very first race. 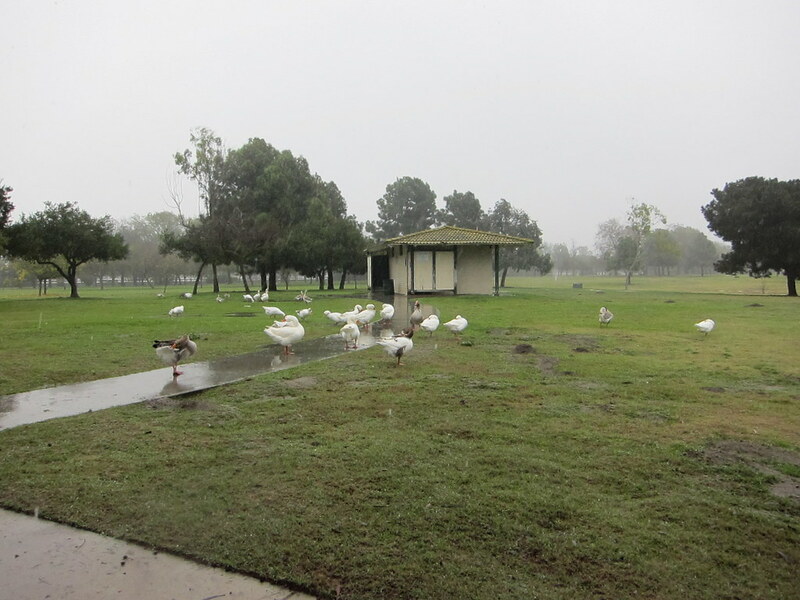 The race was held at a very soggy El Dorado Park. 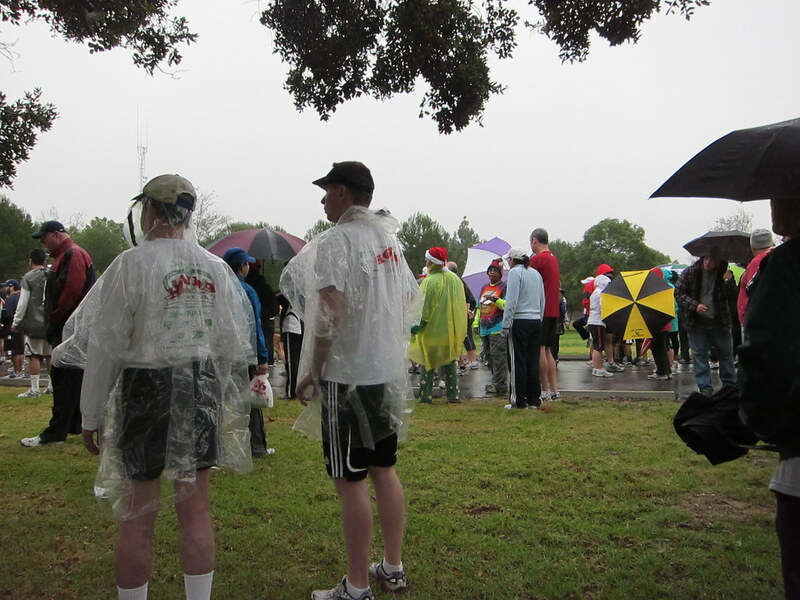 It was amusing to see so many rain ponchos and umbrellas at the Starting Line. 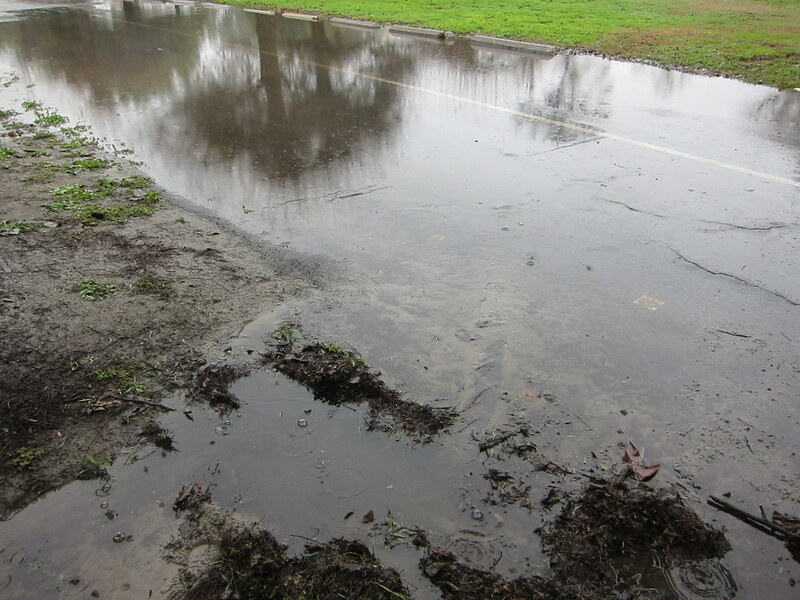 It was a relatively sluggish start because most of the runners were slowing down and going around the large puddles. I tried to keep up with my boyfriend but I lost him and the crowd of runners around him before the Mile 1 marker. At a blazing 13:30 minute mile, however, I managed to leave all the walkers in the dust mud. I maintained a steady pace as I ran around the park. I couldn't stop blinking because of the pelting rain and I regretted leaving my baseball cap at home. After awhile, I started wondering if I was even on the course anymore. There wasn't a runner in sight. I decided I was officially lost when I reached a dead end with the largest ducks I'd ever seen in my entire life. I suddenly realized this was the Summer Solstice Watermelon Run all over again. Once again, since I'm familiar with the park, I started heading in the general direction of the Finish Line when I felt the mileage was appropriate. I ended up having to go backwards through the Finish Line and then I quickly turned around and announced I was actually finished. All the finishers received a full sized Christmas tree. My boyfriend enjoyed his first race and he said he's ready for a 10k! I love to read about all these races you do. Some have the best names ever. Well done to your boy friend with his first race, awesome! A christmas tree...? Fantastic! Glad you made your way back to the finish line!! Congrats to the bf on his first race!! You guys got a Christmas tree??? Wow- lots of rain! Congrats to your boyfriend! A tree is an awesome finisher prize! Green Girl, Kovas posted the cutest story about your Xmas gift. Now, please make this rain stop! wow, running in the rain? you earned that tree! You run the coolest races. I'm tempted to use the names of them for races up here. So creative! It's neat that you guys got a Christmas tree for your prize. Nice *wet* race! Cool that your boyfriend ran with you - congrats to him!